Our Weighted Hula Hoops are not Toys for Little Girls and Boys. 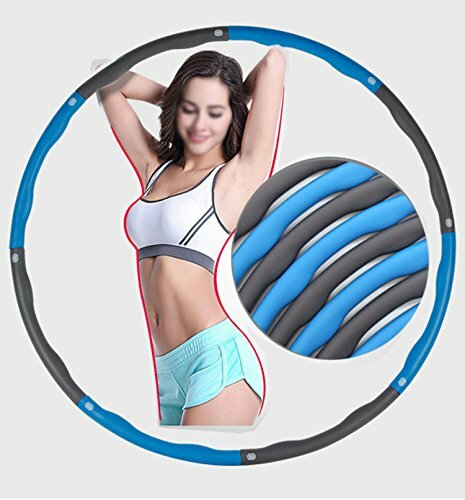 With 8 detachable sections and weighing in at just over 2.31 pounds, You can easily take your weighted hula hoops for exercise with you whether traveling across country or across town. We made the hula hoop weighted to easily assemble and retain perfect balance when used. Michelle Obama, Olivia Wilde, Zooey Deschanel and many, many more. Hoola hoop exercise is the best new way to lose weight and get in shape. Hoola hoop your way to a new day today. The outer layer is a high foam filling that protects and massages your internal organs，which is covered with soft Foam - comfortable for user, easy to clean and resists bacteria and moisture from penetrating the surface. Take it with you on the go，Easy to assemble and disassemble. 6 detachable snap button connectors for easy storage. Great for hot fitness workouts. 100% SATISFACTION GUARANTEE - If you are not COMPLETELY satisfied for any reason at all, you can easily get a fast, prompt refund. So you get to try it out completely RISK FREE! If you have any questions about this product by FFSM, contact us by completing and submitting the form below. If you are looking for a specif part number, please include it with your message.